Republicans are all for states rights. Just ask any one of them and they would cry about the overreaching federal government. 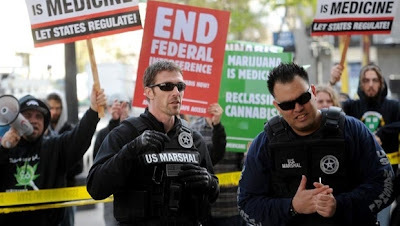 Recently a bill came up in the House that would defund the raids on medical marijuana dispensaries by federal agents. Remember what Mitt Romney told a Colorado reporter recently: "I'm not running on marriage and marijuana, those are state issues, right? Aren't they?" he said following the interview." Well, it looks like all that talk about states' rights was just a bunch of bull. Republicans overwhelmingly voted against the bill on Wednesday (88 percent of Republicans voted against the bill). "If states' rights aren't a good enough reason to pass this amendment, do it because of compassion. Compassion demands it," said Rep. Sam Farr from California. "We offer this amendment for terminal cancer patients," he added, "for AIDS victims, for persons who suffer chronic pain. We offer this amendment not only to protect those people, but we offer this amendment to protect the states that are progressive enough to provide alternative medical options to those who need it."